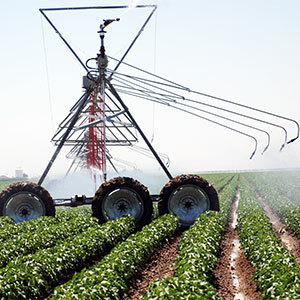 Reduced low pressure center Pivot irrigation systems can use one-third less energy than their high-pressure counterparts. But they also may increase irrigation water runoff and soil erosion unless properly sited and managed, according to a four-year study by the University of Nebraska. The study concluded that reduced low-pressure center Pivots increase the rate that irrigation water is applied to the soil. The greater application rate increases the potential for irrigation runoff and the erosion it causes. A center Pivot operated at a pressure of 40 PSI, compared to 80 PSI for a high-pressure system, can save about 1 gal. of diesel fuel for each acre-inch of water supplied to the crop. With the same pressure reduction, savings of 11.7 kilowatt hours for electric pumps could be realized for each acre-inch of water pumped. The figures assume that irrigation efficiency has not been reduced in switching from a high-pressure to low-pressure system. An acre-inch of water is enough to cover an acre 1 in. deep. Corn requires between 8 and 16 in. of irrigation water each growing season, depending upon climatic variability and location. The scientists noted that, although reduced pressure center Pivots offer substantial energy savings, the potential increase in irrigation runoff may pose an erosion hazard, especially on fine-textured soils with large slopes. Increasing amounts of runoff could lower irrigation efficiency to the point where energy savings from a low-pressure system are nullified. The amount of runoff from a low pressure Pivot irrigation system depends on many factors, including the infiltration characteristics of the soil, application rate of the Pivot system and tillage practices. In their research, on 3% slopes, the scientists found that more runoff generally occurred on plots of corn irrigated by a low pressure center Pivot equipped with spray nozzles. A low-pressure system with impact sprinklers and a high pressure system with impact sprinklers were also evaluated. The scientists also observed that more sediment-laden runoff occurred from plots that had been disked twice before planting and irrigated by a low-pressure Pivot with spray nozzles. In one trial, 29% of the irrigation water became runoff, but most other measurements were less than 10%. The greatest sediment loss from these plots was 130 lbs./acre wich was not excessive. The largest loss of nitrogen from the plots was less than 1 lb./acre. Runoff of 2% or less was measured from plots that were chiseled after planting to increase infiltration of irrigation from the low-pressure system with spray nozzles. Runoff rates of between 3 and 12% of the irrigation water were observed on plots that had been till-planted, an increasingly popular conservation tillage technique. In another part of the study, the scientists developed charts to help irrigatiors select appropriate sites for low pressure centre Pivot irrigation systems.